As part of their membership package, members of the European Academy of Occupational Health Psychology receive an individual subscription to the international quarterly journal Work & Stress. 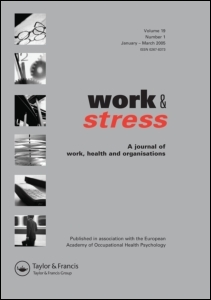 Work & Stress, published in association with the European Academy of Occupational Health Psychology, is an international, multidisciplinary quarterly presenting peer-reviewed papers concerned with the psychological, social and organizational aspects of occupational and environmental health, and stress and safety management. The journal publishes empirical reports, scholarly reviews, case notes, research notes and theoretical papers. It is directed at occupational health psychologists, work and organizational psychologists, those involved with organizational development, and all concerned with the interplay of work, health and organisations. Further information on WORK & STRESS and other relevant Taylor and Francis journal and book titles can be found at on the Taylor and Francis website.